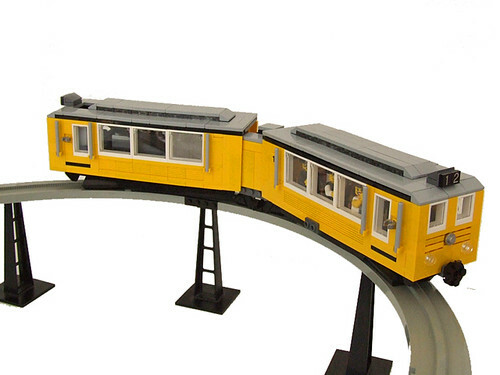 Monorail Train (7w) with PowerFunctions, a photo by ER0L on Flickr. E This PF monorail train was built in May 2013 – a time when the moving cars were still far away. Anyhow the monorail will be an important part of the future city – there’s nothing that can replace this amazing concept. In my view the existing monorail can be integrated very well in smaller city layouts, but I wanted to have something that moves more realistically than the usual monorail trains with their high speed and abrupt stops. So I opted for a MR with PowerFunctions that can move very slowly. And since most of the cars are 7 studs wide to be able to fit the figs side by side, the train has the same width. The train is quite heavy (around 0,6 kilogrammes) but that doesn’t seem to be a problem, neither for the engine nor the tracks – until now, that is. I am watching these aspects thoroughly. The train is controlled by an 8879 Speed Remote Control. Capacity: 10 minifigures.